Home > Google News > Google SEO > Google Webmaster Tools To Offer CMS Upgrade Notifications? Google Webmaster Tools To Offer CMS Upgrade Notifications? 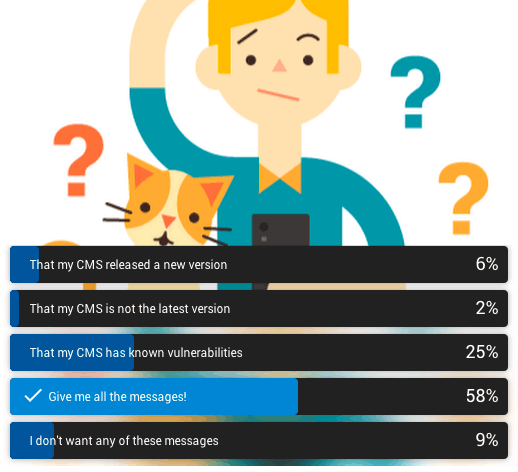 The Google Webmaster Central team posted on Google+ a poll asking users and webmasters which notifications they'd like to see added to the Google Webmaster Tools message center. Google said, "A poll for those of you using a content management system or template to build your site (i.e. Wordpress, Joomla or Drupal). If your preference isn’t listed below, please explain in the comments. What Webmaster Tools message would you find useful to receive?﻿"
Give me all the messages! Nice trick question: I see the first three options as duplicate, as if my CMS released a new version then it is not the latest version and also known vulnerabilities are present in my current version (and the other way around). Of course, he is just being funny. If Google would release it, they'd just do all of them, not one.